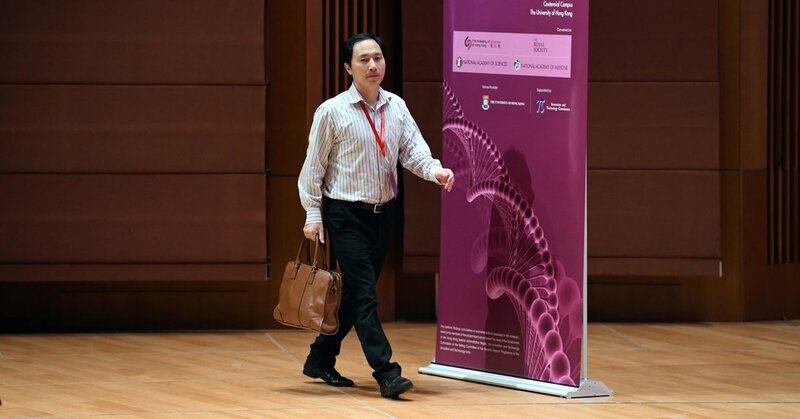 Showing a series of slides, he quickly described three years of work involving mice, monkeys and human embryos. He used the Crispr-Cas9 editing technique to disable a gene called CCR, which creates a protein that allows H.I.V., the virus that causes AIDS, to infect human cells. Dr. He said that with the help of an HIV / AIDS organization in China, he had recruited eight couples in which the man was infected with HIV. and the woman does not have it. One couple gave up and another had a "chemical pregnancy," a pregnancy that fails shortly after implantation of the embryo into the uterus. After modifying the CCR₅ genes, he stated that he used in vitro fertilization to create H.I.V. resistant embryos. The goal, he said, was to conceive babies who would not be vulnerable to H.I.V. infection. Many scientists have noted that there are other, simpler ways to protect the newborn from an infected parent, especially an infected father, from the H.I.V. virus. Embryo editing should only be used to prevent or treat serious medical conditions that can not be treated otherwise, they said. But Dr. He suggested that the parents of the twins, especially the HIV-positive father, view the procedure as a way to find their reason for living. "I am most proud because they had lost all hope of life," said Dr. He. "But with this protection, he sent a message saying that he would work hard, earn money and take care of his two daughters and his wife all this life." The scientists also objected that Dr. He had not fully informed his colleagues, his university or parents of what exactly he was doing. For example, while the consent form he gave to potential parents mentioned gene editing in the text, he initially described the research as a "development project for an AIDS vaccine."